Second week of using Yammer in school went surprisingly well. We had chance to see why is great to be connected through social network and how urgent information could be easily shared when you have your own online group. 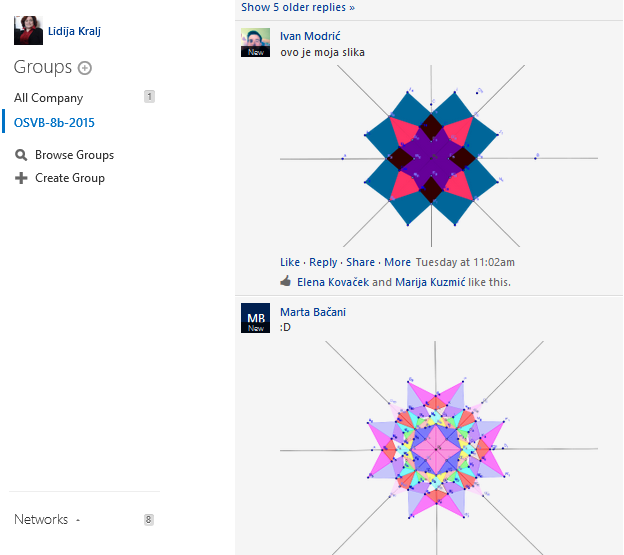 As mentioned in previous post our first task was about kaleidoscope. Students weren’t able to find any real kaleidoscope at home but their parents and grandparents mentioned that toy was usual on village or church fairs when they were young. That leaves us to digital creation of kaleidoscope. For that students used GeoGebra app for Windows 8. GeoGebra is very powerful tool for mathematical investigation, discoveries, visualisation and of course geometric construction. Since it is available in more than 60 languages it is perfect tool for international projects too. I use it in eTwinning projects often, but m ore about that in some other article. For creation of kaleidoscope students used four lines angled at 45°, draw set of polygons between first two lines and then mirrored it to make full circle. 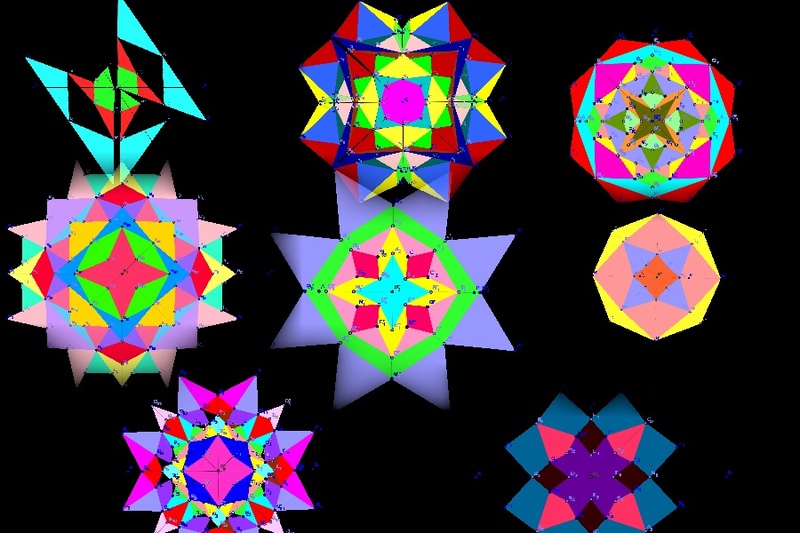 Those lines represent mirrors in original kaleidoscope toy. After construction students saved pictures and published them in our Yammer group. In just few minutes our beautiful digital gallery was online. That step show one more great side of social network – each student could show their work right there in class without e-mailing, collecting and publishing. Instant gallery! What I missed in this experiment is some sort of organizing posts regarding kaleidoscope, so next step is introduction of tags and hashtags so when our collection of digital works in Yammer become too big we could easily find what we are looking for. During our math class I received information about new class schedule which supposed to be implemented next day. In that moment I was very happy that we started using Yammer group because with one message I shared new schedule with whole class. That is what I call “full speed sharing”. They were happy discovering that shared file could be easily downloaded and that all files from posts are already listed in File section of group. Students realised that Yammer has possibility to pin important information on top page, so soon our new schedule showed up as pinned note.